Visit our blog as we explore Android Application development. Check back for new applications and development tips. 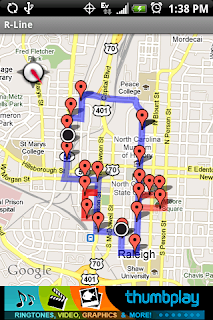 I just published an application that displays real-time status of Raleigh, NC's downtown buses. Currently, Raleigh's monitoring is limited the R-Line route. The two buses show up as black dots. Red markers are bus stops. The blue line is the primary route, and the red lines show the evening (after 6:30PM) modified routes. The app was fun to create. It leverages web services, Google's Map APIs, and Quattro's advertisement APIs. Sorry about the ads, but I couldn't help myself to try it out. They should at least be occasionally targeted to the RDU market. Data updates every 5 seconds, although the bus data is usually only updated from the buses every 30 seconds. Future enhancements I hope to include click-able markers to display the stop name, bus name, etc. Make sure you've upgraded to version 1.16 to ensure you continue to receive bus location updates. Great idea BUT it crashes immediately and consistently after opening on my Motorola i1. Plus on the compass, East and West is backwards. Please fix because this app will then be AWESOME!! For those interested, you can monitor ALL of Raleigh's buses at RaleighRides.org, although currently only via the internet, not on a mobile.